A young Iranian-born American woman who rallied her wealthy family to underwrite a $10m (£5.3m) competition for the first private spaceflight will soon get to experience for herself the thrill of being a space tourist. 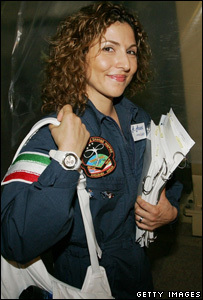 On Tuesday, Anousheh Ansari was confirmed as the replacement for Japanese businessman Daisuke Enomoto as a fare-paying passenger onboard the next Russian rocket mission to the International Space Station (ISS). Lift-off for the Soyuz capsule that will carry Mrs Ansari and two members of the next ISS crew is scheduled for 14 September from the Baikonur Cosmodrome, Kazakhstan. In her quest to fly in space, Mrs Ansari, co-founder of Texas-based Telecom Technologies, helped seed the development of a private spaceflight industry by donating $10m for the X-Prize competition, which was awarded in 2004 for the first pair of suborbital manned flights. The winning vehicle, called SpaceShipOne, was built by aircraft designer Burt Rutan and funded by Microsoft co-founder Paul Allen. A commercial version of the ship is under development by Rutan's Mojave, California-based firm in partnership with Sir Richard Branson's newly created Virgin Galactic spaceflight enterprise. The company has sold about 200 tickets for flights, which are scheduled to begin in 2008 from the Mojave Desert. Mrs Ansari holds a reservation. She also spearheaded a new family venture called Prodea to develop a line of air-launched suborbital vehicles in partnership with Virginia-based Space Adventures, as well as spaceports in the United Arab Emirates and Singapore to launch them. More recently, she jumped at the chance to train as a reserve for Mr Enomoto in the hope of clinching the grand prize of spaceflight: a 10-day trip to the space station. "Anyway you can fly me, I'll go," she said in an interview last month in Houston. In the end, her wait may be far shorter than expected. 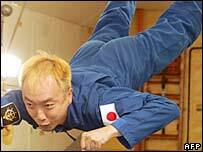 Mr Enomoto, 35, was stripped of flight privileges earlier this week for undisclosed medical reasons. It was not immediately known if he would remain eligible to fly on a future mission. If he is, Mr Enomoto may be just as happy to wait. Russia recently added a $15m (£7.9m) option to its basic $20m (£10.6m) fare - a 90-minute spacewalk outside the ISS. As for Mrs Ansari, she will have to fly without the projects she wanted to do in space and she may end up having to eat the meals ordered by Mr Enomoto. Hopefully, though, she will be able to bring along some of her own clothes. The Japanese businessman - a young-at-heart science-fiction fan - had sent ahead his spacesuit: an outfit modelled after cartoon pilot hero Char Aznable from the Gundam animation series.